In the first part and the second part of this series of articles on analyzing Debian packages with Neo4j we gave a short introduction to Debian and the life time and structure of Debian packages, as well as developed the database scheme, that is the set of nodes and relations and their attributes used in the representation of Debian packages. The current third (and for now last) part deals with the technical process of actually pulling the information from the Ultimate Debian Database UDD and getting it into Neo4j. We will close with a few sample queries and discuss possible future work. Creating a Neo4j database from the set of nodes and relations. The UDD has a public mirror at https://udd-mirror.debian.net/ which is accessible via a PostgreSQL client. For the current status we only dumped information from two tables, namely the tables sources and packages, from which we dumped the relevant information discussed in the previous blog post. We first tried to use the command line client psql but due to the limited output format options of the client we decided to switch to a Perl script that uses the database access modules, and then dumped the output immediately into a Perl readable format for the next step. The complete script can be accessed at the Github page of the project: pull-udd.pl. The complicated part of the process lies in the conversion from database tables to a graph with nodes and relations. We developed a Perl script that reads in the two tables dumped in the first step, and generates for each node and relation type a CSV file consisting of the a unique ID and the attributes listed at the end of the last blog post. The Perl script generate-graph operates in two steps: first it reads in the dump files and creates a unique structure (hash of hashes) that collects all the information necessary. This first step is necessary due to the heavy duplication of information in the dumps (maintainers, packages, etc, all appear several times but need to be merged into a single entity). We also generate for each node entity (each source package, binary package etc) unique id (UUID) so that we can later reference these nodes when building up the relations. The final step consists of computing the relations from the data parsed, creating additional nodes on the way (in particular for alternative dependencies), and writing out all the CSV files. The last step was creating a Neo4j database from the CSV files of nodes and relations. Our first approach was not via CSV files but using Cypher statements to generate nodes and relationships. This turned out to be completely infeasible, since each Cypher statement requires updates in the database. I estimated the time for complete data entry (automated) to several weeks. Neo4j recommends using the neo4j-import tool, which create a new Neo4j database from data in CSV files. The required format is rather simple, one CSV file for each node and relation type containing a unique id plus other attributes in columns. The CSV files for relations then link the unique ids, and can also add further attributes. We see the unique id, which is tagged with :ID (see the neo4j-import tool manual for details), and the name of the source package. IMPORT DONE in 10s 608ms. Looking at the script build-all that glues everything together we see another step (sort-uniq) which makes sure that the same UUID is not listed multiple times. which returns the top package debhelper with 55438 packages build-depending on it, followed by dh-python (9289) and pkg-config (9102). We have shown that a considerable part of the UDD can be transformed and be represented in a graph database, which allows to efficiently and easily express complex queries about relations between the packages. We have seen how conversion of an old and naturally grown RDB is a laborious job that requires lots of work – in particular domain knowledge is necessary to deal with subtle inconsistencies and corner cases. visualization in Chrome or Firefox is very dependent on the version of the browser, the OS, and probably the current moon phase. Bug database: Including all the bugs reported including the versions in which they have been fixed would greatly improve the usefulness of the database. Intermediate releases: Including intermediate releases of package that never made it into a release of Debian by parsing the UDD table for uploads would give a better view onto the history of package evolution. Dependency management: Currently we carry the version and relation type as attribute of the dependency and pointing to the unversioned package. Since we already have a tree of versioned packages, we could point into this tree and only carry the relation type. UDD dashboard: As a real-world challenge one could rewrite the UDD dashboard web interface using the graph database and compare the queries necessary to gather the data from the UDD and the graph database. Graph theoretic issues: Find dependency cycles, connected components, etc. 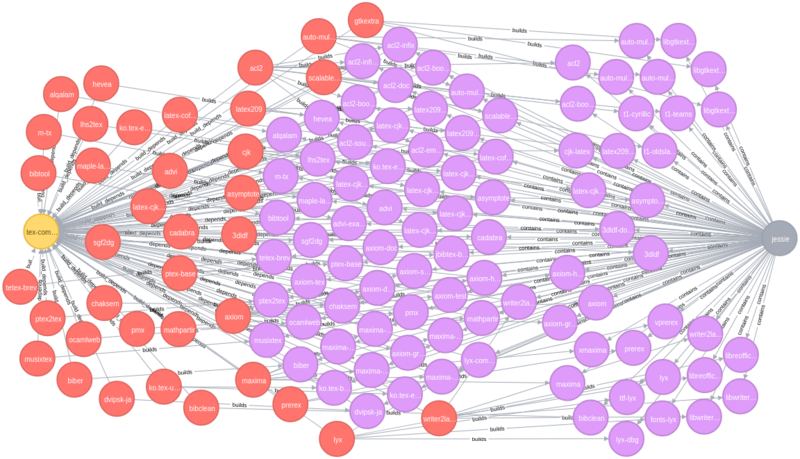 This concludes the series of blog entries on representing Debian packages in a graph database.